Street parking is available, and off-street parking is available courtesy of Southside Baptist Church, across the street behind the church (with the exception of Sunday mornings and Wednesday evenings). Led by two-time James Beard nominee Chef Tom Gray, Town Hall is a community gathering spot for sharing good food and drink in good company in the heart of Historic San Marco. Our contemporary American menu draws inspiration from the seasons and we fill our menu with ingredients from local farms and artisan purveyors. 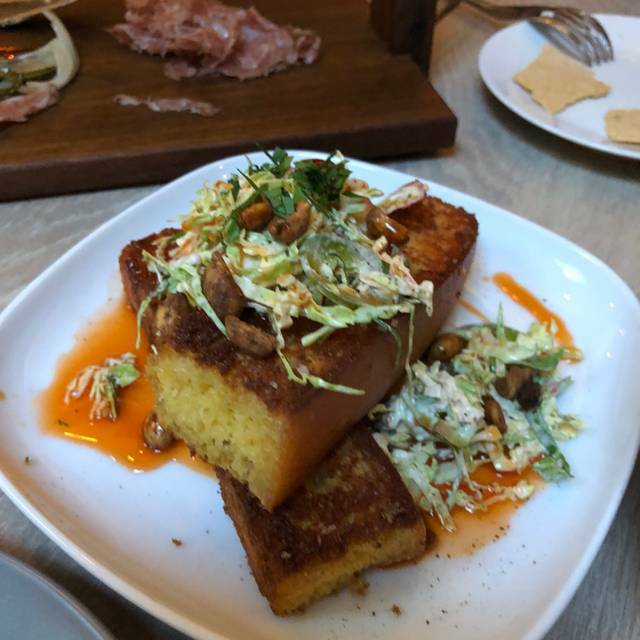 Start with our Cured & Aged meat and cheese tower, Duck Fat Cornbread with spicy slaw or Steamed Mussels with chorizo, spicy tomato and garlic toast. Signature entrees include Hand-Cut Pappardelle, Seared Local Fish and New York Strip. From our Brunch menu, enjoy Smoked Salmon Toast or Cast Iron Toast to pair with your Bottomless Mimosa. 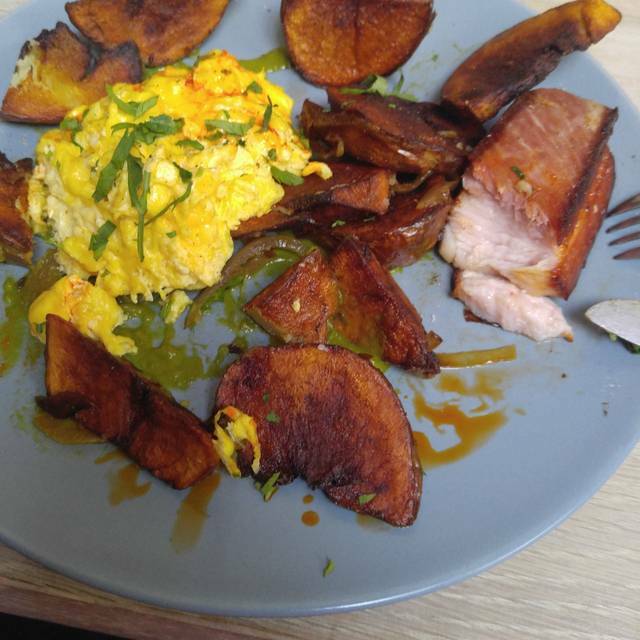 Every day should be brunch day! Ours is served Sundays from 10am - 2:30pm. Be sure to include bottomless mimosas or one of our handcrafted cocktails in your brunch plans...cheers! 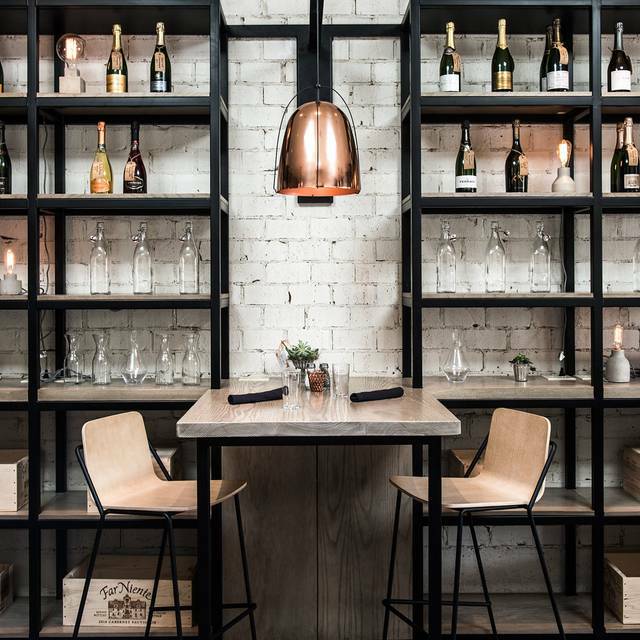 Our Full Wine List, Bubbles, Local Draft Beers, Handcrafted Sodas, Sips + Coffees also available at Brunch. Enjoy bottomless mimosas at brunch every Sunday 10 am - 2:30 pm! Town Hall requires a credit card to hold a reservation. Any reservations cancelled within 48 hours of the reservation time will be charged a $25 cancellation fee per party. Loved our waitress and charcuterie was fab. Great drinks but was sorry my fav crispy Brussel sprouts were 86’d. Amazing brunch on Easter Sunday! A Foodie's Dream! The food was tasty and well prepared. The staff was friendly and knowledgeable. as usual, we had a great time at Town Hall. The food is always wonderful and the staff is great. Love Town Hall. I looked at menu ahead of time and had my heart set on the Local Fish. They didn't get their delivery that day so that was a bit disappointing. The food is really good; it's a small menu though so if you only want one item, you may want to check ahead of time. Fantastic experience! 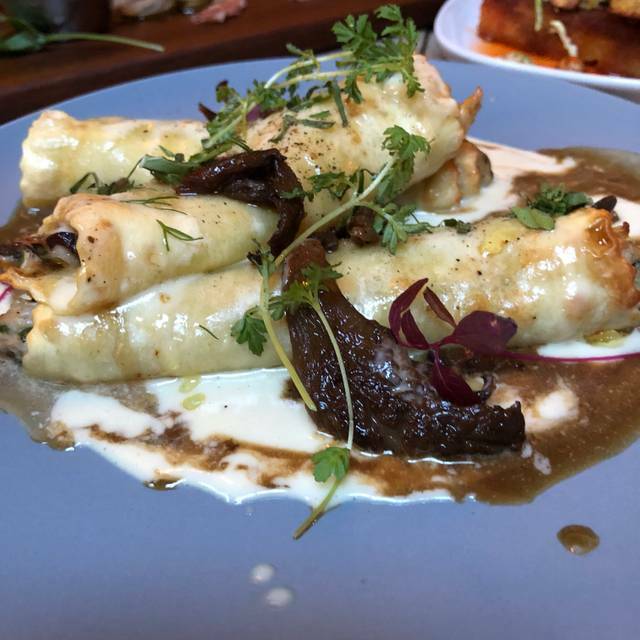 The food was delicious, our server was engaging, but polite and the ambience was the perfect balance of chic but comfortable. Great location with great vibe. Our server, Parker, was fun, attentive and knowledgeable. 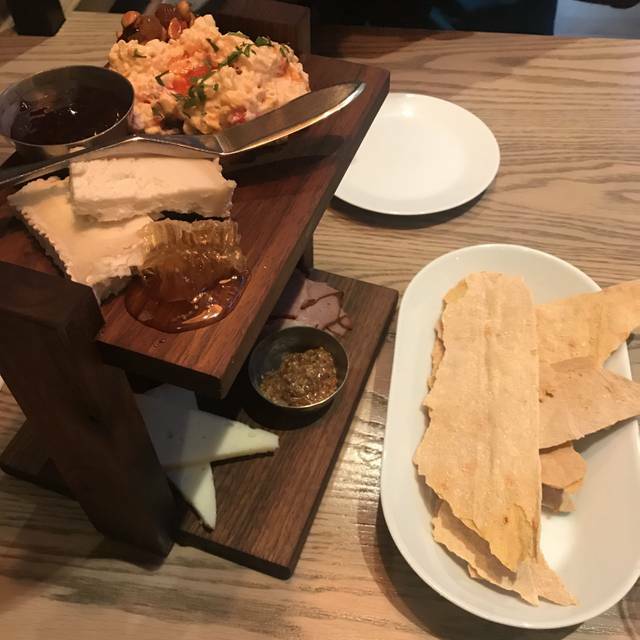 The food was both very good and creative. The menu was diverse and offered something for everyone. Town Hall should be on your rotation , if it isn't already. This is by far one of my favorite restaurants in Jacksonville! Every single time the experience is above and beyond! The staff is overly friendly and helpful! And the food is absolutely delicious! Definitely recommend to anyone who wants a good meal and good service! We always have a great dinner at Town Hall. The menu is not very extensive (which I prefer) and the preparation changes often. 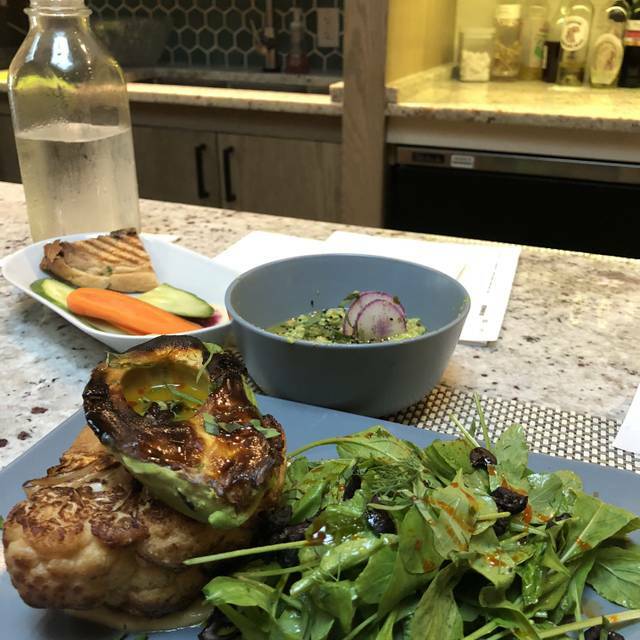 We are so lucky to have Town Hall as one of our neighborhood restaurants so having a menu that changes to keep up with the freshest ingredients is refreshing. I had the salmon and my husband had the chicken. Both were so very tasty. As a bonus, it was Monday and they have select wines at half price. We were able to have one of our favorite wines at a very reasonable price. We recommend Town Hall. Hint, the noise level is higher in the back room so if there are no more than two of you eating and you don't mind high top tables or at the bar, I would sit in the front section. Town Hall does not disappoint! Among our group we had the sweet pea hummus, the cauliflower steak, the scallops, the fresh fish and the pasta bolognese. Everything was great although I felt my fish was a bit too salty. We shared desserts with the chocolate cake and banana pudding. Our server was especially attentive as were all staff who made sure Mom had the help she needed. The only complaint was that we had wanted the duck fat cornbread, put our order in the moment we sat down at 5:30, but it didn’t materialize until almost 2 hours later! The cornbread is really good but its place in the world of dining shouldn’t be at the tail end of dessert! I rated the restaurant as "quiet" but we were dining there on a slow Sunday evening, still early, very few patrons inside. Overall the experience was excellent. The menu options seemed a bit limited; I chose two sides, both were delicious. My companion reluctantly selected the chicken dish, recommended by our server. After two days, he's still raving about that chicken! We reserved our table on open table only to get there and then to say they don’t honor Open Table reservations. The food was okay. They were struggling and super busy. The drinks were great. It was great even though Robert wore flip flops because he is a garbage person who doesn't respect Bro-unch. Would Recommend, very good everything. They called a few hours ahead to make sure we would make our reservation. We were seated immediately. everything the four of us ordered was delicious. The "sides" are generously portioned and big enough for 4 of us to share. I felt the wine by the glass was overpriced. Highly recommend for a special occasion or if you want very flavorful healthy food options. Absolutely outstanding brunch!!! Loved the flexitarian menu... something for everyone. We will definitely be back! Everything was delicious. Server was outstanding. Can not recommend the pimento cheese grits. They really should come off the menu or readjusted. Very soupy, lacked flavor and the flavor that was in there was not pleasant. Three of us in our party of eight had them and all had the same opinion. Tried to doctor them with salt but salt didn’t help. Otherwise a great time and loved everything else. Very refreshing to find a wonderful restaurant that appeals to Foodies. My friend & I love to cook, enjoy a great drink or discovering a new wine to pair with food. We enjoy trying new dishes & exploring flavors to attempt & re-create at home. Town Hall well done! Great flavors & wonderful staff. We’ll be back! Great local restaurant with amazing food, personalized service and modern decor. They now have an extensive cocktail menu too! Great food, service, and vibe. We ate at the bar and the cocktails and wine list are as good as the menu. I had the salmon & my husband had the steak. Both were perfectly seasoned & tasted divine! Not thrilled with the banquet-type seating, but that's just us. Attentive service. Will definitely return. We had an excellent experience in every way! Love Town Hall! Excellent service from greeting to serving. Enjoyed all of our food! We will go back!!! Seated right away. Not a fan of the narrow "two top" but it was a busy night (concert in town) so all tables were full. Waitress attentive and personable. Ordered Oyster App. They were a little chewy but good flavor. 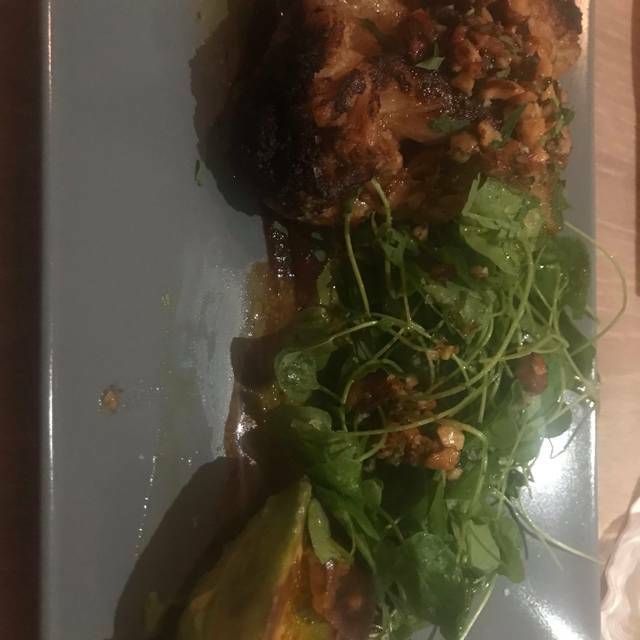 Husband got the Pork Cheek. Very tender. Excellent flavor. Loved the Brussels. I got the Salmon. One piece was a little over cooked but the other was perfect. Didn't have time to order dessert (our fault, not theirs) so cannot comment. We will be back. Little Gem in San Marco. Great service, ambiance and food. Through no fault of the restaurant our last minute reservations forced us to sit outside. Their outside dining area is not very comfortable and squeezed onto a busy narrow sidewalk. The inside of the restaurant was much nicer but loud. We started with cocktails. My old fashioned was very good but a little heavy on the bitters. My wife's very dry very dirty martini was not dry enough. 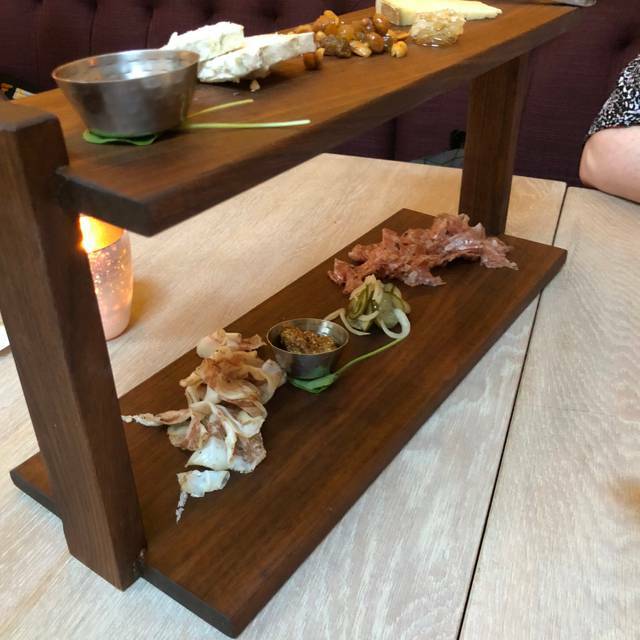 We also enjoyed a charcuterie plate which was excellent. As for entrees I enjoyed the fresh fish of the day (Mahi Mahi) which was very good. My wife enjoyed the strip steak. While the entrees were good, they lacked any real pop. We also ordered a side of the crispy brussel sprouts. We did not enjoy these as they were covered in oil. I would be willing to give them another shot based on the reviews from others I read and that maybe a more comfortable setting would make me less critical. Excellent food and service. Brussels sprouts are a must have as well as the octopus. Inventive options and great mixed drinks. Would definitely recommend. We went on wine tasting night and even though it was supposed to be going on for another 1/2 hr. we were told it was too late to participate. I suspect that is because they had too many other people doing it. The food was good and the service was fine. It was very loud and we were having to shout across the table to each other to be heard. It seems like a good place to hang out and have a few drinks with friends but it is not a quiet , slow enjoy you dinner kind of place. This is a great spot for a business meal or a special occasion but I like to go for every day dining! It’s the cutest little gem in San Marco with food that is out of this world! I’m so impressed each time I go back and try something new. Probably some of the best service I've had at a restaurant in a long time. Food was excellent. Fish was prepared to perfection. gets a little noisy and right before we left another table was seated really close but maybe that's part of the ambiance.. Overall I'd highly recommend it and make sure to try the pimento cheese spread you won't regret it! Every thing we ordered was suberb. The “sure thing” cocktail was indeed a sure thing. I ordered a basic salad with chicken and the flavors and ingredients were amazing. My husband had the half chicken, my son had the NY strip. Both cleaned their plates. Their take on a banana split was delish. Thanks! 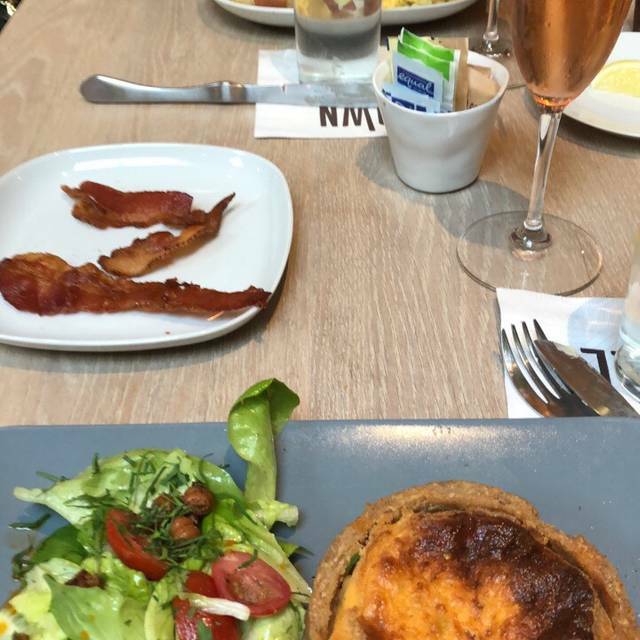 My friends and I enjoyed our brunch at Town Hall. The atmosphere was great, our server was very attentive, and the food was delicious. Will absolutely make this one of my regular favorites. Food was as great as the service. Definitely worth trying if you're a foodie! The only complaint I have is that they had a Valentine’s Day menu with a Lobster Gnocchi that was sold out by 8. Other than that it was a great meal.